Every oil on canvas painting made by us is created by using high-quality oil-based paint, as well as the best brushes and canvas found on the market. As mentioned, our pieces are 100% customizable. However, if you would like to request any specific changes or alterations to your piece, be sure to e-mail our team once your order has been placed, and one of our artists will be in touch with you as soon as possible. If we are not notified of in a timely fashion about your alteration requests, our artists will simply go ahead and reproduce your painting exactly as is shown in our galleries. All throughout human history, talented artists have continuously been creating stunning works of art that continue to evoke awe and inspiration in the hearts of art lovers from around the globe. And, while almost any artist will have a few fans of their own, there are only a select few of them that have managed to outshine the rest and establish themselves as the true art masters of our time. Below, we’ve created a list of some of the world’s most famous artists, whose works can be found in our online gallery and reproduced specifically for you. So, without further ado, let’s dive in! Read more about the most famous artists of all time here. Jacobo Amigoni was a Venetian portrait artist and historical painter. He was known to have traveled all throughout Europe and managed to create numerous magnificent works of art in the style of the Venetian Rococo masters. 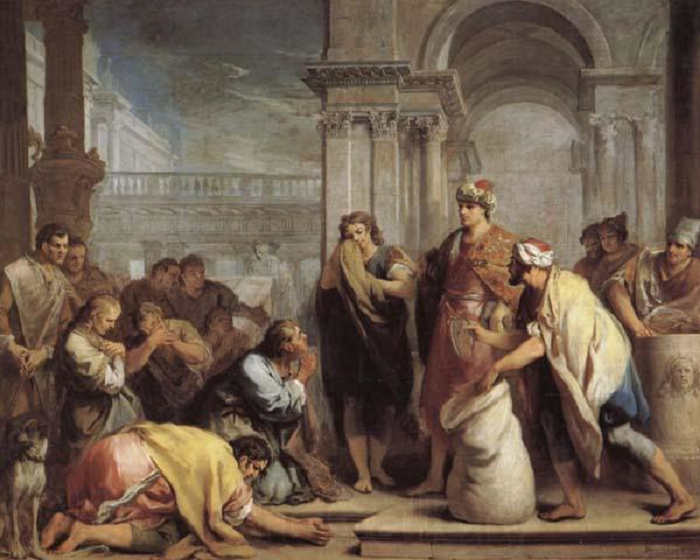 Furthermore, Amigoni borrowed many elements of his style, as well as his technique from some of his contemporaries such as Sebastiano Ricci and Tiepolo. During his early years, Amigoni spent some of his time working in the court of Bavaria, up until in 1730, when he traveled to London, England to work on several major design projects, such as the Rickmansworth and Moor Park Golf Club. Amigoni then remained in London for nearly two decades, up until 1747, when he became the official court painter of the Spanish Royal court. Amigoni is most notably known for his classic work, the Madonna and Child, as well as many other famous renaissance masterpieces. He passed away in 1752, however, his art can still be found on display throughout all of Europe and North America. Known as one of the most famous artists from the Dutch Golden Age, Willem Van Aelst specialized in creating still-life paintings that were mostly focused on wild flowers and game animals. Born in Delft, Netherlands, Van Aelst was brought up in a family of wealthy city magistrates and taught to paint by his uncle and still-life artist, Evert Van Aelst. Then, in 1643, Van Aelst enrolled in the artist’s Guild of Saint Luke at Delft to eventually become a master of his craft. Van Aelst would also go on to live in France, between the years of 1645 – 1649, before traveling to Florence, Italy, where he would serve as the official court painter to the Grand Duke of Tuscany, Ferdinando II de’ Medici. Eventually, the Grand Duke publicly awarded Van Aelst with a gold chain and medallion as an acknowledgment of his unparalleled talents at the time. Although Edgar Degas did his best to distance and separate himself from the movement, today, he is considered as one of the founding fathers of the Impressionism movement, which can easily be seen by his vivid and accurate depictions of colors and light. Furthermore, Degas is known for his unequivocal knack for being able to capture movement and display it in his magnificent works of art. While he also focused on other subjects, the majority of his pieces depict graceful dancers, as can be seen below in his 1878 masterpiece, The Star. This stunning work, completed in 1878, depicts a lone ballerina on stage performing an arabesque, while a dark figure stands behind her in the shadows. Although the dark figure appears to be her patron, who would have likely owned the young girl, the ballerina still seems to be enjoying the moment as she performs her dance. 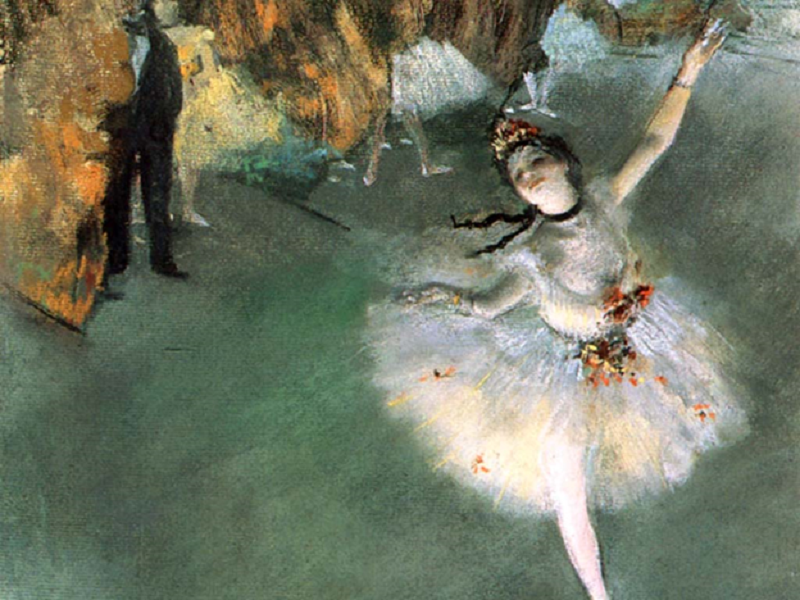 The Star is known as one of Degas’ most famous works of art and is currently on display at the Musée d’Orsay in Paris, France. Here, at 1st Art online, we pride ourselves on creating high-quality art reproductions, as well as fully custom portraits and oil paintings. Our skilled team of talented artists always uses real paint, and real paint brushes, to create some of the most realistic art reproduction on the market today. Each one of our creations are completely handmade, and come with a certificate of authenticity, which ensures your paintings are indeed 100% handmade pieces, created just for you.